◆Wash skin thoroughly after handling. ◆Use only outdoors or in a well-ventilated area. ◆If on skin: Wash with plenty of soap and water. ◆If in eyes: Rinse cautiously with water for several minutes. ◆Call a poison center or doctor if you feel unwell. ◆If skin irritation occurs: Get medical advice/attention. ◆If eye irritation persists: Get medical advice/attention. ◆Take off contaminated clothing and wash before reuse. ◆Store in a well-ventilated place. Keep container tightly closed. Phaitanthrin E was biomimetically synthesized from methyl indole-3-carboxylate and methyl anthranilate or anthranilic acid using the ester group as an activating group…. 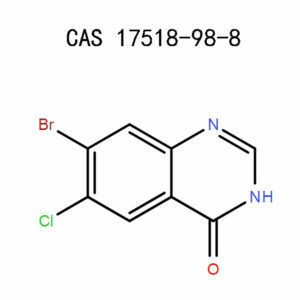 We synthesize the finest6-Bromo-4-chloroquinazoline.HCL salt in large quantities for scientific research, development, or chemical synthesis. Our production is in line with the chemical manufacturing control system and the cGMP standards. 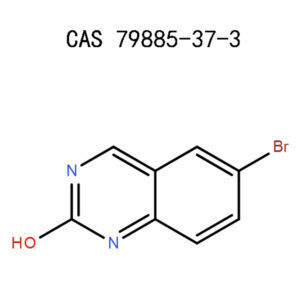 6-Bromo-4-chloroquinazoline.HCL salt falls in the category of quinazolines, which are heterocyclic compounds exhibiting anti-cancer properties. 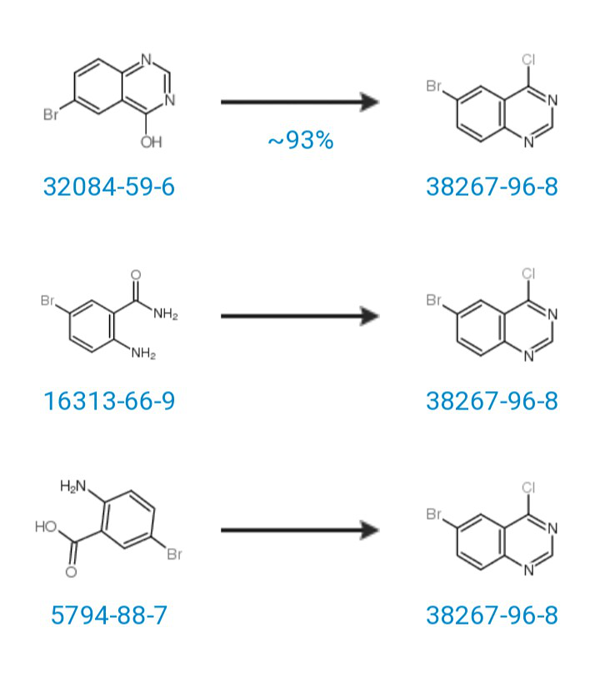 An analysis of the crystal structure of KY04031, a PAK4 inhibitor (PAK4 IC50 = 0.790µM), is the initial stage of discovering the mechanism of cancer progression. The design of PAK4 inhibitors mainly focuses on the crystal structures. Through this evaluation, we established the likelihood of altering the KY04031’s triazinecore to a quinazoline.With KY04031 as our reference compound, we started off by designing and synthesizing specific derivatives of 2,4-diaminoquinazoline. Upon analysis of PAK4 inhibiting properties on the synthesized derivatives, we identifiedcompoundPAK4 IC50 = 0.033µM.This compound, otherwise known as 9d, notably stirred up G1 phase cell cycle.It inhibits the invasion of A549 cells, which are responsible for expressing PAK4. 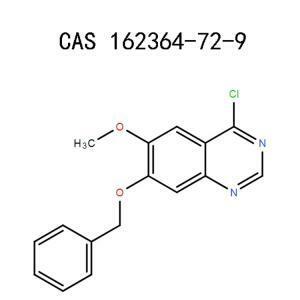 Therefore, it controls the PAK4-LIMK1 signaling path.From our findings, we inferred that compound 9 is a potential anti-cancer drug and aprincipal research probe for biological assessment of PAK4. During synthesis of quinazoline and newbenzopyrano[2,3-d]pyrimidine derivatives from several aldehydes, ammonium acetate, and 2-amino-benzophene, poly(N,N’-dibromo-N-ethyl-benzene-1,3-disulfonamide) and N,N,N’,N’-tetrabromobenzene-1,3-1,3-disulfonamidewere the essential catalysts.These catalytic agents produce high yields.Quinazolines are synthesized from several aldehydes, ammonium acetate, and 2-amino-benzophene while benzopyrano[2,3-d]pyrimidine are acquiredfrom specific cyclic amines, salicyclic aldehydes, and malonitrile. The product is used as a pharmaceutical intermediate for anti-cancer drug discovery. 6-Bromo-4-chloroquinazoline (38267-96-8) is a beige solid, existing in powder form. 6-Bromo-4-chloroquinazoline is classified as an irritant.It causes the inflammation of the eyes, respiratory system, or skin, depending on the point of contact. The irritation may be acute and persistence, especially to the eyes, leading to a possibility of permanent damage. Some of the random symptoms include skin reddening, watery eyes, soreness, dizziness, chest tightness, coughing or wheezing. If first aid is administered in good time, the harm may be slashed downtremendously. Only handle 6-Bromo-4-chloroquinazoline.HCl salt (38267-96-8) when you’ve got the full knowledge and experience with hazardous materials and related precautions. If you are inexperienced, use it under the supervision of a qualified user. Dress in the approved protective equipment as per the international laboratory safety rules. Cover the face with a standard full-face mask, safety glasses, and use a respirator, which complies with the NIOSH or EN regulations. Wear heavy rubber boots and impervious gloves. Also, ensure you work in a laboratory well-equipped with a fume hood and exhaust ventilation for maximum air purification and aeration. If you do not have a permanent working area, use the product outdoors.Do not breathe in dust, vapors, fumes, or gas. Store the product in a dry and ventilated area and make sure the conditions of the place can be regulated. For long-term storage, keep refrigerated under -20°C. 6-Bromo-4-chloroquinazoline.HCl salt (38267-96-8) should be sealed in a safe container, locked up, and out of reach of the unauthorized personnel.Always pack it in the original packaging. Immediately after handling 6-Bromo-4-chloroquinazoline.HCL salt, observe proper hygiene by rinsing the hands thoroughly with generous amounts of water and soap.Strip off the contaminated clothes and clean them before using them again. Clear the bench by collecting the used products, contaminated bottles, spillages, leakages, and empty containers. Temporarily keep these wastes in an airtight vessel before giving them off to a local licensed disposal company. One sure way to avoid the health hazards of 6-Bromo-4-chloroquinazoline.HCl salt (38267-96-8) is by putting on the recommended personalprotective equipment. Likewise,proximity with an eye bath and a safety shower will minimize further damage, which the irritant may cause. The product is primarily hazardous only when it interacts with the body. Move the person to an aerated area. Watch for any signs of breathing difficulties, unconsciousness, or shortness of breath, and support the breathing with an artificial respirator. In extreme cases, seek medical aid from a physician. The remedy of this hazard is wearing a safety respirator and using the product outdoors or a room with enough exhaust ventilation. Thoroughly rinse the mouth for not less than 10 minutes. Drink up to half a liter of milk or water. Watch out for severe symptoms such as nausea, diarrhea, or dizziness, and seek immediate attention from a medic.As you contact a poison center or a doctor, carry this safety data sheet with you as a reference. 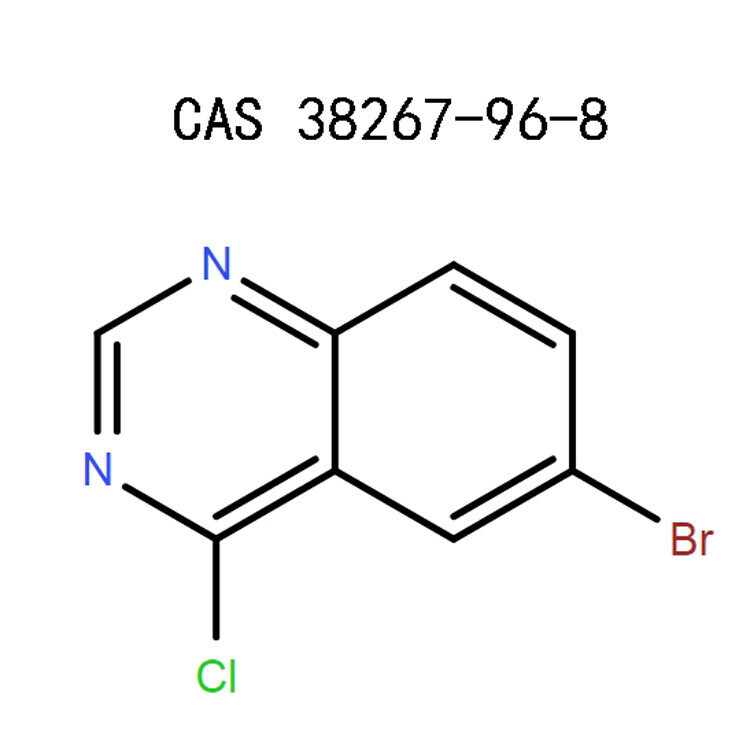 This hazard mainly comes about when eating or drinking while using 6-Bromo-4-chloroquinazoline.HCl salt (38267-96-8). Failure to wash the hands after use can also lead to accidental swallowing. If in the eyes, remove contact lenses and rinse with adequate quantities of cold water for 15 minutes. Wash by separating the eyelids. Due to a high likelihood of 6-Bromo-4-chloroquinazoline.HCl salt (38267-96-8) damaging the eye, seek medical aid. When the product makes contact with skin, bathe the area with a lot of soap and running water for around 15 minutes. Note that, contact lenses or contaminated clothes and shoesought to be removed before carrying out this first aid. As a rule, protective gears are a must have when dealing with potentially hazardous chemicals.6-Bromo-4-chloroquinazoline.HCl salt (38267-96-8) will possibly decompose into toxic gases and fumes when burnt. This property calls for the need of wearing a self-contained breathing apparatus. Put out the blaze with carbon dioxide, polymer foam, or dry chemical powder. The extinguishing media depends on the fire intensity and the causative agent. Although no data is classifying 6-Bromo-4-chloroquinazoline.HCl salt (38267-96-8) as abioaccumulativecompound with adverse environmental effects in PBT identification, take care not to allow it to enter theregular water courses. Clean up the leaks and any spills by mixing with an absorbent material like sand. If in a solid state, scoop the masses and collect in a closed container and arrange for proper disposal. Do not subject the product under high temperatures, light, flames, heat, or sparks. Similarly, avoid exposure to strong bases, oxidants, or acids.These conditions may cause decomposition of 6-Bromo-4-chloroquinazoline.HCl salt (38267-96-8), forming poisonous CO, CO2, HCl, NOx, and HBr gases. The eradication of 6-Bromo-4-chloroquinazoline.HCl salt (38267-96-8) should comply with the federal, state, and international regulations. Connect with the licensed local authorities for convenient waste disposal.Alternatively, mix the product with an ignitable solvent and burn in a chemical furnace. 6-Bromo-4-chloroquinazoline.HCL salt is safe for all shipping methods provided that the conditions are regulated. As you handle 6-Bromo-4-chloroquinazoline.HCl salt (38267-96-8), adhere to all the relevant regulations. The APICMO team comprises of dedicated scientists who stand out in all fields involving chemical analysis, research, drug discovery, material and life sciences, and synthesis of chemicals. You can order 6-Bromo-4-chloroquinazoline.HCL salt in bulk or small quantities.Just sign up to be a registered user and log in to view the quotation. Contact our customer service to make an order. Chem Sources International Directories Publishing Company Incorporated, 2008, Chemical Industry, Page 1001-1010. Advances In Heterocyclic Chemistry, Volume 104, Edited By Alan R. Katritzky, Page 462. National Centre For Biotechnology Information, US. National Library Of Medicine, Pubchem, 4,4-Difluorocyclohexanone, Sections 1-9.